The Pacific Northwest’s first European explorers (Spanish) arrived in 1543, followed by the British in 1778. Other explorers, including Lewis and Clark who spent the 1805-1806 winter near the mouth of the Columbia River were also part of the early non-native visitors to the region. But it would take the establishment of the Oregon Trail to bring more than explorers and traders to the region with the Great Migration of 1843 depositing 700-1000 new emigrants in the region. With this new influx of settlers, it wasn’t long before the first brewery opened in the region. The introduction of beer and brewing into a region usually coincided with the arrival of Europeans. Or, more specifically, as we have seen over the course of this blog, the arrival of Germans. The region of the Pacific northwest that we now know as Oregon is no different, with the German Henry Saxer establishing the first brewery, Liberty Brewery in 1852, seven years before Oregon became the 33rd state. However it was a different Henry from Germany, Henry Weinhard that would take control of the brewing industry and grow production in the Pacific Northwest to 100,000 barrels by the year 1890. But Henry’s production levels would only last for 24 years, with the state approving a ban on the manufacture and sale of intoxicating liquor in 1914, five years prior to the national prohibition. Like many other breweries of the time, Weinhard’s brewery made it through prohibition brewing near-bear, syrups and sodas. After prohibition the brewery was merged and sold multiple times, finally brewing its last beer in 1999, as part of the Miller Brewing Company. While Oregon may have lost its early brewery to the mergers and acquisitions during the bad years in American brewing, it still retains a healthily number of local breweries. So many in fact, that Portland Oregon is considered to have more breweries within the city limits than any city in the world, and thats not all. 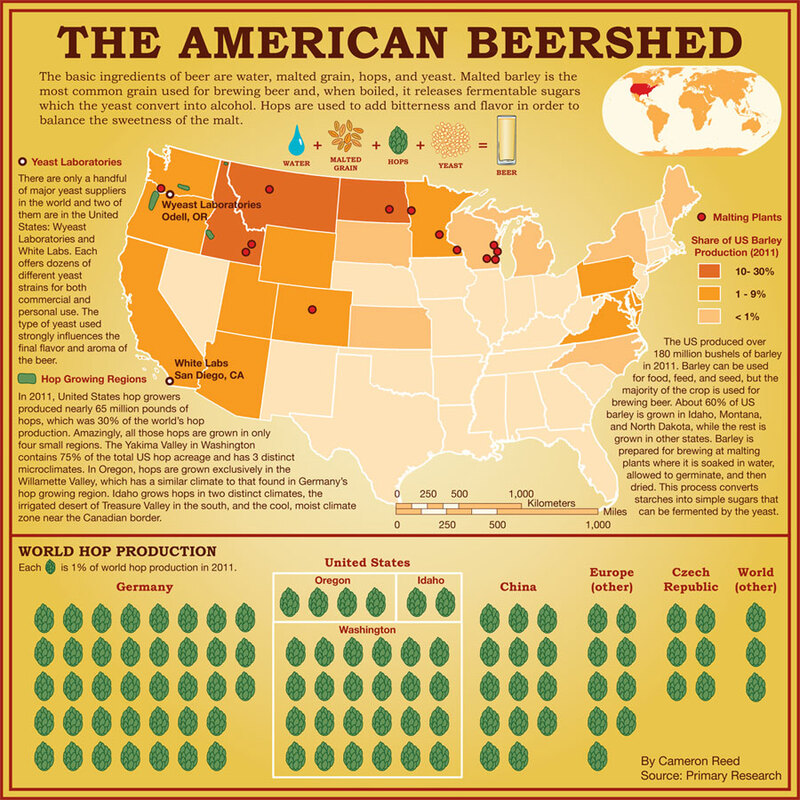 Oregon has also become a critical component in the brewing process. With its Willamette Valley producing 4% of the worlds hops crop and the entire state producing almost 9% of the U.S. barley crop each year. With contributions like those, Oregon is definitely a beer healthy state. Given the number of breweries in the state, it is not unexpected that finding Oregon beer in my part of New England requires little effort. Beer from breweries such as Rouge Widmer Brothers and Deschutes frequent the shelves. As a result, I wasn’t being too particular in my selection and quickly grabbed three bottles from two different brewers. One from Oakshire Brewing and two from Base Camp Brewing Company. 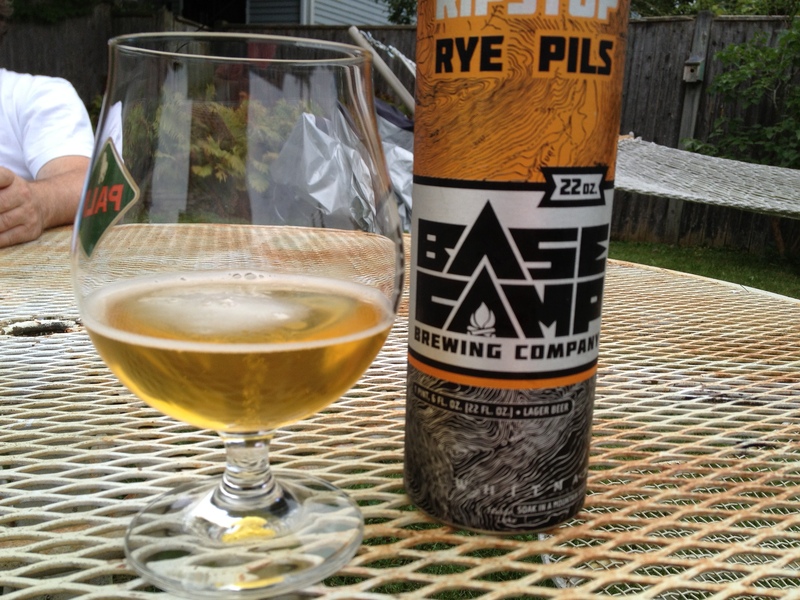 Both of the bottles from Base Camp were actually metal cans, and play on the Oregon, outdoors feel. They both featured topographic map backgrounds and contained text relevant to the outdoors life style, such as references to streams, and packs and hiking. This led one of our tasters to refer to the bottles as having an Eddie Bauer feel. I didn’t mind them, and enjoyed their rustic feel. We started the evening off with a Rye Pilsner called Ripstop (a type of fabric often used in outdoor gear.) I found this to be a fun beer, and would happily toss it in my pack. It had a nice, but not over powering, hoppy taste. In the glass, this beer was light in color. I couldn’t get much of an aroma from the the beer, but that probably had to due with the just out of the fridge, cold nature of the beer. After the Ripstop, we moved on to the next bottle can, this one, an India Pale Lager called In-Tents. The brewer says this beer aged on an in-house toasted blend of white and red oaks, and that taste was hard for me to get over. In the glass, this beer was darker than the Pilsner and had a nice hoppy smell. But I kept coming back to that smoked oak taste. This beer reminded me of some of the Kentucky beer, with its oak barrel aging coming through in the flavor, but others actually enjoyed those barrel aged beers and felt this one had something slightly off. The final beer of the evening was a seasonal from Oakshire called O’Dark:30. The name, derived from the dark malt ingredient, mixed with a pre-dawn brewing, pays homage to the slang beer 30, but it also reminded one taster of the movie Zero Dark Thirty. 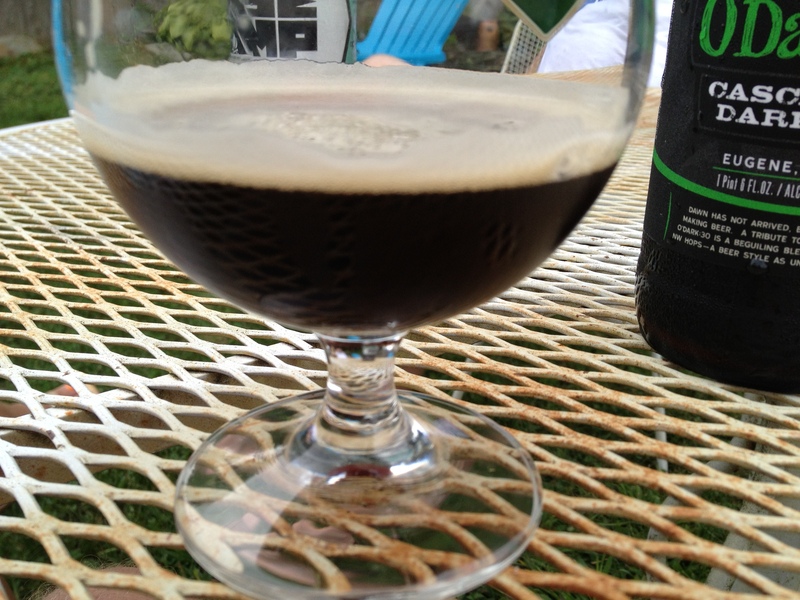 In the glass, this beer was dark, with a clean distinct head, and had a wonderful smell. Always a fan of a dark ale, I was looking forward to this beer, and was not let down. It was full of rich flavors and had a clean, smooth finish. Definitely my favorite of the night. That wraps up Oregon and week 33. Next week, we head back eastwards to the state of Kansas.